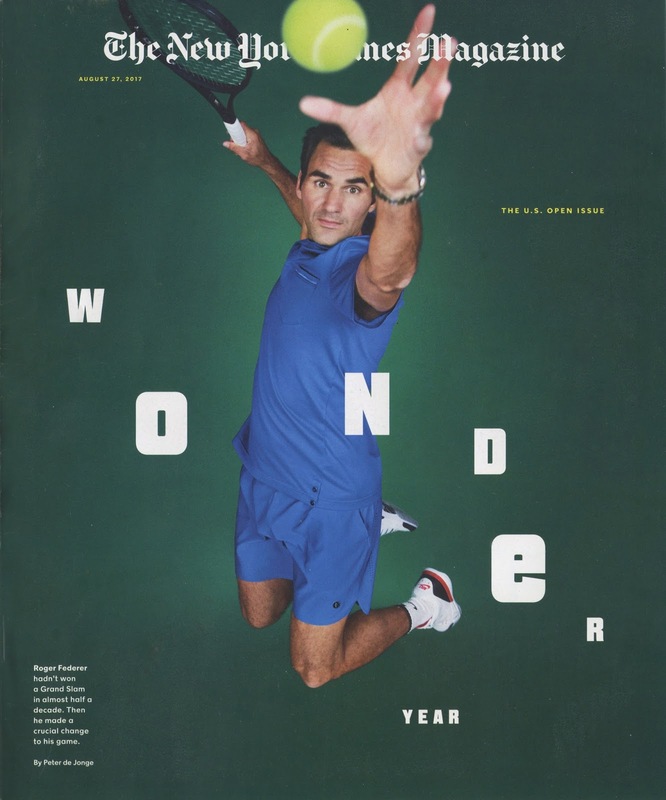 The NYT explained its goal for the cover: "Like all great athletes, Roger Federer makes the impossible look easy. So we decided to go with an action shot that captures his grace and dynamism." My dictionary doesn't recognize these uses of the terms, "action" and "dynamism." To me the freeze frame photo of Federer hovering in air looks inert and static. There is no suggestion of speed, and in fact the strangely meandering word "wonder" (in random type faces in miscellaneous sizes) dominates the figure and neutralizes any semblance of movement or direction or thrust. 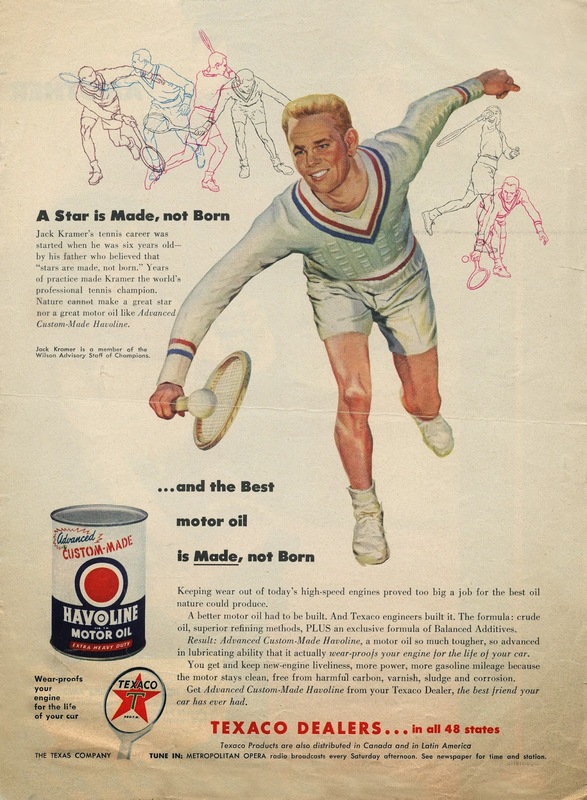 The visual emphasis placed on an outstretched hand releasing a ball seems to be the antithesis of "dynamism." 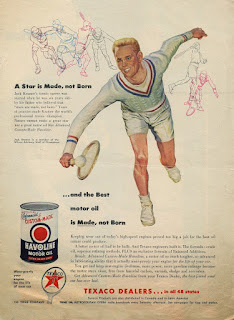 A few years ago on this blog I wrote about how sports illustration in the 1950s tended to rely on frozen, stop-motion images that looked hopelessly stolid. 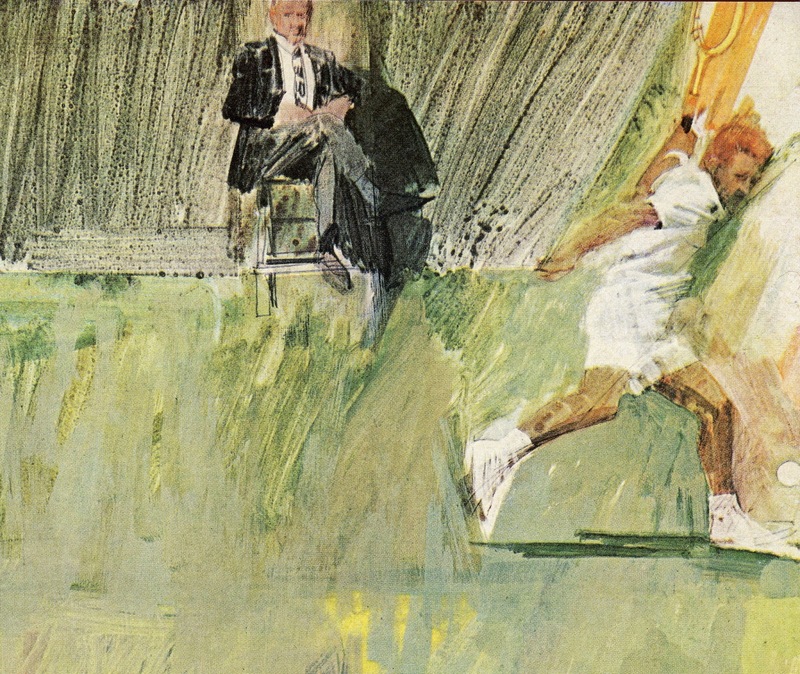 Then in the 1960s, imaginative illustrators developed fresh ways to capture speed. They learned from action painting and abstract expressionism in the fine art world; they learned from movies, by blurring or repeating images rather than carefully capturing a single Muybridge snapshot; they learned from impressionism and expressionism (going back to J.M.W. Turner's revolutionary masterpiece, Rain, Steam and Speed); they learned from Einstein's special theory of relativity that spacetime bends as velocity increases toward the speed of light. The following examples are from Bernie Fuchs' brilliant illustrations for Sports Illustrated in 1961. Note the figure in the foreground starting to stretch to the right with Einstein's spacetime. 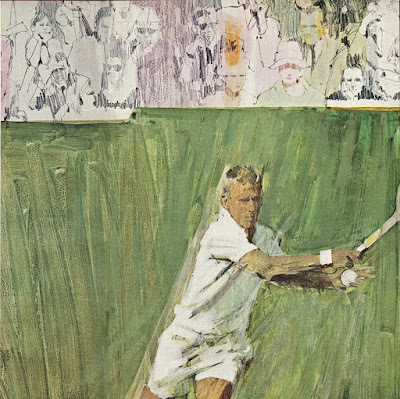 He used slashing lines and rapid brush strokes to create sensations of speed. He captured figures in truly dynamic poses with traction and thrust, not merely floating in air. He selectively used sharp focus or blur to convey motion and emphasis. These are among the tools of a sophisticated artist. If the goal of yesterday's NYT Magazine cover was "action" and "dynamism," I think by comparison these 1960s examples make the cover look sick. How much we have forgotten! The concept of "progress" applies in science but not so much in art. In science, each new generation can build on the objective discoveries of the generation before. But in art, prehistoric cave paintings may be just as beautiful and sensitive as a picture made yesterday. It's not unusual for art to take one step forward and two steps back. But if we are aware of our history and work in good conscience, it's at least possible to take two steps forward and only one step back. The cover is of a piece with the table of contents inside the issue, which, like so many Times Magazine contents layouts these days, is an utter horror of floating numerals of various sizes that are, I imagine, supposed to represent bouncing tennis balls, and are about as easy to focus on. Legibility is once again sacrificed to gimmickry. All to say: the frontal lobe is just utterly, unbearably and drearily shite at making anything visual, in other words; anything that is an embodiment of a synthesis. Ah, yes. Never listen to anybody at the new york times talk about imagery. The pain. This is one of Fuchs' classics. The times cover is the epitome of frozen photography. I might put Occam before Einstein regarding Fuchs' expressive distortions. The Fuchs is awesome. That Times cover is a frigging mess. The difference between illustration and photographs. Our social media age is really only equipped to deliver moments, not narratives. Snapshots. At the most, we share clips. We can show the serve of Roger Federer in an Instagram post, but we would struggle to truly capture the volley in one image. Fuchs manages to layer not just information, but relativity in his brush strokes. And does so without a character count. Chris-- I totally missed the idea of the letters representing bouncing tennis balls. They looked like they formed a sine curve to me. Thanks for pointing that out. (I wish that made me feel better about the cover). Chris Bennett-- Well, certainly many frontal lobes are exactly as you describe. But how do you feel about the work of Saul Steinberg? Kev Ferrara wrote: "Never listen to anybody at the new york times talk about imagery." The NYT has run some fine pen and ink work in the past, but in recent years I agree they seem to be subject to the same plague of intellectual tastelessness that has infected so many other publications. You'd think that the esteemed NYT could do better. For the last few years Businessweek was a bright and imaginative voice; I used to look forward to their creative covers every week. This summer they decided to overhaul their look and voluntarily turned to the most dull, vacuous covers imaginable. MORAN-- I'd phrase it slightly differently: a lack of sensitivity for the potential of images (whether illustration or photography) and a lack of imagination. 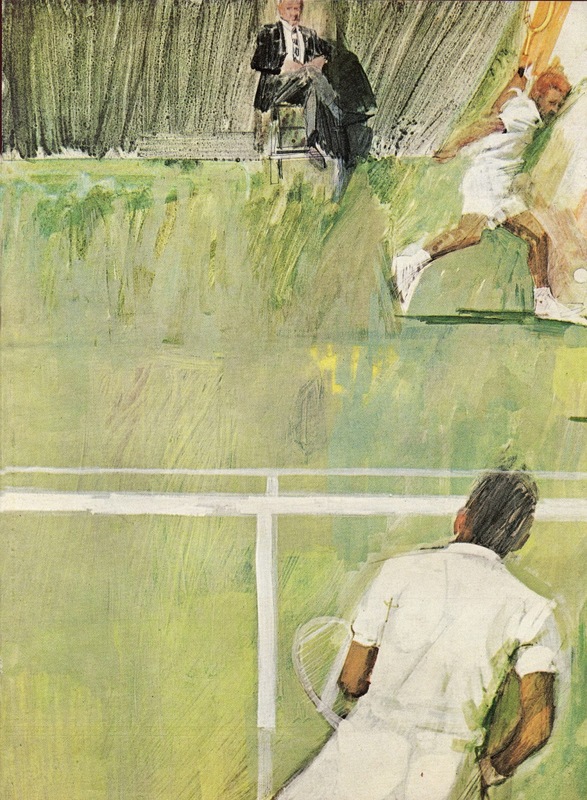 Back when Fuchs was painting covers for Sports Illustrated, there was a range war going on between the photographers and the illustrators. Fuchs continued to receive assignments because his paintings were better than the photographs, but the photographers actively attempted to sabotage his work. 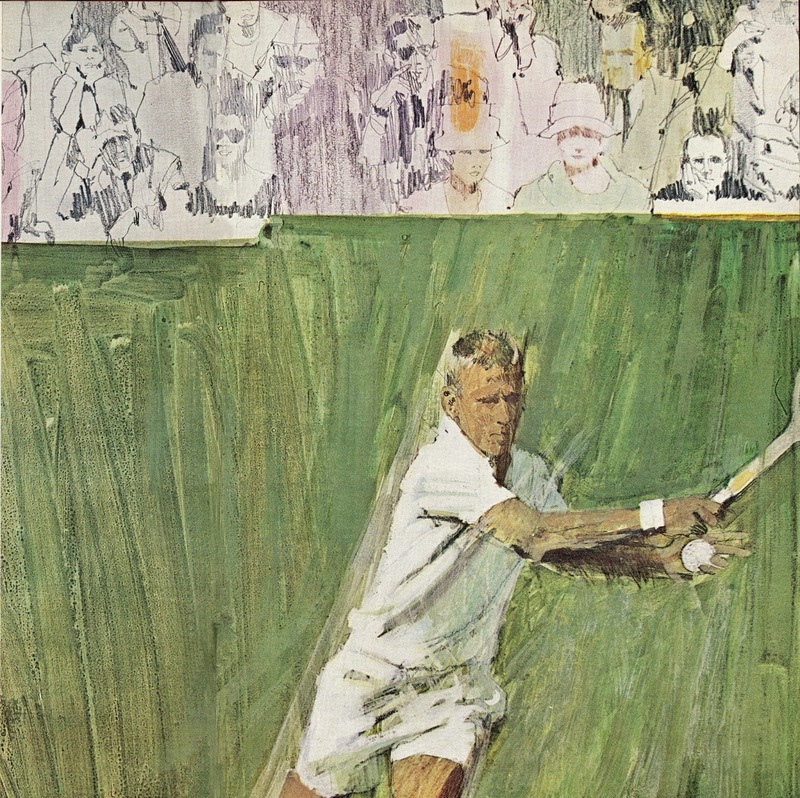 When Fuchs was assigned to do a cover on the Masters tournament, the SI photography editor George Bloodgood told Fuchs, "this should have been a photography assignment and I fight for my photographers....Don't think you're going to get inside the ropes [to see the action close up]." Bloodgood was ordered by management to cooperate but he continued to practice guerilla warfare against the illustrators. Kevin wrote: "Fuchs manages to layer not just information, but relativity in his brush strokes. And does so without a character count." C'mon guys ... get with the program! That NYTMag cover was CREATIVE!! The strange pose, that unreadable word dribbling across the page, the rest. The greatest impression I retain from art school so many years ago is that creativity trumps everything!!! So there. On a more serious/relevant note, recall the Italian Futurists who for better or worse attempted to depict motion on an otherwise static canvas. The examples show how each artist adapted ideas borrowed from photography, such as speed blur, motion blur, and fragmented or multiple images to capture an impression of fast action. David said; Well, certainly many frontal lobes are exactly as you describe. But how do you feel about the work of Saul Steinberg? Interesting question David. Steinberg's drawings are diagrams of intellectual conceits written in a style akin to the whimsical, more plastic language of Ronald Searle. As far as I see it; the conceit itself is hit upon by his subconscious which is then coded into an information graphic. The character of his whimsical line disguises the fact that the content of his drawings depends on it, but this is not the case, the content, although sourcing from the synthesising subconscious, is literary in origin, not plastic. Donald Pittenger-- The futurists were certainly another good example. I think their efforts were a little clumsier, but then they were there at the very beginning when machines began to produce speeds faster than nature had ever witnessed-- certainly faster than the human hand could move a brush. So it understandably took a few generations to figure out what worked. James Gurney-- Thanks for a most interesting link. I must say, I didn't share Ron Lemen's enthusiasm for Dexter Brown (his favorite). When his cars begin to fragment into that shimmering "diamond diffraction" look, Brown seems to imply that speed has obliterated his subject matter, like a friable satellite disintegrating due to the speed of re-entry into the atmosphere. To me they seem more like the artist has given up trying to hold his subject matter together, and surrendered to a bath of light and pattern. More to my liking were artists on his list like Alfredo de la Maria. I notice that Peter Helck (a true blue lover of race cars) doesn't seem to make anyone's list any more. Apparently he is no longer fast enough. Chris Bennett-- I'll probably regret asking this, but what do you conclude from your point that the source of the content for Steinberg's "diagrams" is literary in origin? I don't disagree with your characterization, but if you conclude that Steinberg's literary content delegitimizes him as a visual artist, then we disagree. I would say that Steinberg is a visual artist in that his ideas are communicated visually, but he is not a visual artist in the sense of someone who expresses plastically, in other words; communicating by a grammar of sensual symbols. His drawings are not composed to do this, they diagram a literary conceit, for example: 'a drawing of a man drawing a man drawing a man...' Or 'a lady playing an instrument that suggests it should be a grand piano but is seen as sound because it looks like a peacock's tale'. The delight is in recognising that what is being represented is impossible - Heath Robinson's contraptions are a species of this form, as are Escher's works. Of course Steinberg is using plastic means. How else does a line get bent or wiggled? How else does a silhouette get shaped? There is also much sensual meaning in Steinberg's work, he often goes for highly abstracted ideas sensually presented and of course, highly abstracted scene drawing/illustration. Who said line couldn't communicate sensually? Even the silliest funny animal cartoon has sensual meaning to it. What differentiates the qualities of one level of work from another is just how much meaning is on offer, and how forceful that meaning effects us. Though, true, there is also much Steinberg's his work that is word-based, or symbol-based, thus requiring translation to sensual understanding for processing. But don't forget that there is no kind of meaning that isn't sensual to some degree. There is nothing else in our brains but sensation. The difference between highly intellectualized ideas and emotional/sensational ideas is the difference in aesthetic charge present, the former often crossing into "dead metaphor" territory. The only kind of communication that has no aesthetic charge at all is one which we don't comprehend at all. Gabino Amaya Cacho is an artist multifacético, Madrilenian painter that began his career artist to early age. Lover of the art thanks to his grandfather. It covers several artistic fields eat: the sculpture, arts and jobs with chair Pedro Young. It is also, educational in two schools of arts in Madrid. You are absolutely right, and thanks for tightening up my understanding of this - and how else would I recognise the whimsy of Searle's line in Steinberg if this were not the case? I shot from the hip in my reply to David's question and was misleading in my answer. Your "What differentiates the qualities of one level of work from another is just how much meaning is on offer, and how forceful that meaning effects us." is nearer the mark. But it doesn't completely frame what I'm trying to get at with the example of Steinberg, Escher, Heath Robinson et al. I'm going to have to think about this more deeply than I have. What the heck is he supposed to be doing in that picture?? 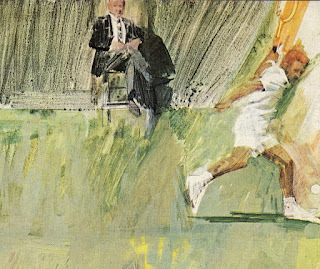 Has anyone anywhere ever served a tennis ball like that? Quite a statement when Fuchs' paintings are easily more "realistic" than a hi-def photo. I've had a further little think about Steinberg's work regarding David's question. The characteristic content of Steinberg's oeuvre, as far as I can understand it, is the visual pun rather than a literary conceit which I, wrongly, first stated. The idea of the-man-drawing-the-man-drawing-the-man for example, only works when it is portrayed visually. So the meaning of his work depends on visual communication. And to connect this to my initial point about the limitations of the frontal lobe; a pun is a particular species of the act of synthesising differing elements. And synthesis arises from the subconscious, not the frontal lobe. I think “visual puns” doesn’t really cover it. In giving it some thought, I think Saul Steinberg does two things simultaneously which when combined allows for his particular brand of wit. One, he turns everything physical he depicts, through line, into linear abstractions; cartoons. And two, he imaginatively transforms into cartoons things that are normally highly abstract, like thoughts, beliefs, concepts, meanings, words, and especially lines themselves. Now, because he treats lines themselves as physical things, and everything he sets down is, more or less, written in line, everything he sets down exists in his art at an equivalent level of “physical reality.” That is, everything is a linear abstraction that simultaneously has the same level of cartoon-physical existence. And this equivalence between elements from otherwise wholly different realms, allows elements from both worlds, the metaphysical and physical, to not only co-exist in the same cartoon reality, but to interact, as it were, as characters of equal physical standing; to bump up against one another and wrestle and tango. And this, I think, is the source of Steinberg's visual wit. I don’t think there is a word for this poetic trope. It is something like "Metaphysical Personification." I also think this kind of thing goes on in all good visual art - the physicalization of thought, emotion, and the ineffable - and has since the beginning. Just that Steinberg is cartooning everything outright, and has no other task but to be visually witty, so he is free to be as imaginative as he likes, and free to exclude all other possible artistic concerns that might dampen his musings. Yes, this does take it a lot further. Many thanks for this. I guess this is why I thought of his drawings as whimsical diagrams of the impossible. Your thoughtful unpacking of the issue and insight has now made me understand why. I think comparing apples to oranges to yet again hold an illustration vs. anything else posture, is off the mark in this piece and example. Yes the photo conveys the pause before the strike in tennis, we know the ball is coming but where? is conveyed creatively by the type placement. And it clearly is a beauty shot, the target of this fluff piece in NY Times Magazine. In short, it works, and is effective based on that. david, i wasn't sure where better to message you about this, so i settled on your most recent blog post. are you familiar with the south korean artist kim jung gi? i would be curious to read your thoughts on him, especially considering your previous writings regarding quality drawing in comics. kim started his career as a comics artist and has in recent years moved into what could be considered live drawing performances. he draws everything (a) from memory and (b) straight to ink. there is really no one like him. i sense that you tend to focus on american artists but this guy's fan base has gone global in the past few years. Anonymous-- I don't disagree that the NYT cover photo is a "beauty shot" for the handsome Roger Federer. My point was that the NYT photography editor's stated goal for the cover as "an action shot that captures his grace and dynamism"-- was not met. It was a big mistake, in my opinion, for her to brag in writing about her success. I do take your point when you say, "give us a little break from the midcentury-NY school over anything else." I must have discussed over 150 different illustrators on this blog, but you're right, recently I've been returning more often to a handful of illustrators because I've written books about them and I possess special information-- family photos, background stories, anecdotes from interviews and other information that nobody else has. I want to put that information out there. I admire a wide range of illustrators but I don't like to blab about someone when I have nothing new to contribute. Anyway, thanks for the needed reminder, I'll start posting about a wider range of illustrators again. Frank Mullins was my illustration teacher. He did a lot of work for Sports Illustrated. I also had the honor of being taught by one of the best children's book illustrators, Ed Young. He even has his own Wiki Page! I love your blog and drool on my keyboard. You do pick the best of the best! Thank you!